A strand of pearls, whether in a necklace or bracelet or a pair of pearl earrings, is a beautiful investment that can be passed down as a precious family heirloom. However, unlike other types of jewels, such as ultra-hard diamonds, pearls are incredibly delicate and easily damaged, both by not cleaning them enough and by cleaning them improperly. Never put your pearls in an ultrasonic jewelry cleaner as you might with other precious stones, as it's a sure way to damage the outer layer of the pearl. Because of the way in which pearls are formed, they need extra care. To put it simply, a small seed, bead, or particle is covered in a shiny nacre, a composite substance that is secreted by the mollusk as a sort of inner shell. This soft nacre coating on the pearl's exterior is the main reason pearls are considered fragile and, therefore, need extra care when handling them. The thickness of the nacre coating depends on the type of creature involved, the water it lives in, and how long the intruder is left in place before it is removed. As nacre thickness increases, so does the quality and durability of the pearl. If the nacre of your pearl is thin and fragile, it can easily be chipped off, which can leave unsightly gaps, chips, or cracks, particularly if cleaned with harsh chemicals or put in a jewelry cleaner, such as an ultrasonic cleaner. In the worst case, the pearl can unravel entirely, leaving you with a dull, lifeless bead. Even fake glass and plastic pearls need special care because their coating is significantly thinner and more fragile than nacre. Simply put, you should give the pearls a gentle cleaning every time you wear the jewelry. 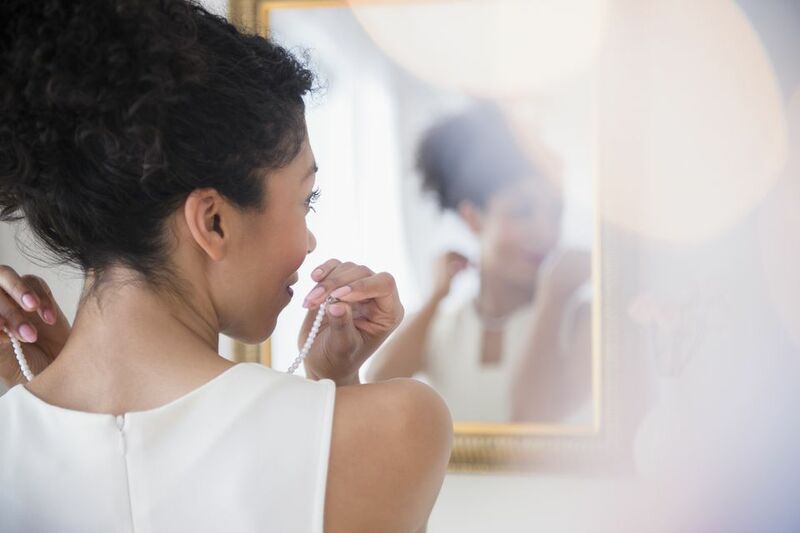 Wipe the pearls with a soft cloth every time you take them off to keep the pearls' luster and remove body oil and other debris that might be on the surface. Other than that, give the pearls a deeper cleaning if you feel like they look dingy. Take the pearls to a jeweler once a year to double-check both the jewelry's integrity and to give them a proper, thorough cleaning. Even cultured pearls with thicker coatings are more fragile than most other gemstones, so you must handle them carefully to keep them in the best condition. Gentle and conservative cleaning are the keys to successful pearl maintenance. If you notice your pearls are lacking luster, it could be that they've been cleaned too often or too rigorously. Before any cleaning, double-check that the jewelry is still in good condition. With necklaces and bracelets, take a close look at the silk strand on which the pearls are threaded, ensuring that it hasn't stretched, and make sure the clasp opens and closes properly. For earrings, check the attachment to the posts. Mix a solution of lukewarm water and a few drops of mild detergent or dish soap. Water that is too hot or too cold may damage the surface of the pearls, so double-check the temperature before using it on the jewelry. Dip a soft, clean cloth into the water and gently wipe down the pearls. Don't put the whole necklace into the water, as it could weaken the thread. Dampen another soft, clean cloth with fresh water. Wipe off the pearls to remove any soap residue. Place the pearls on a soft towel and let them air-dry thoroughly before returning the jewelry to storage. This helps preserves the elasticity of the silk thread on which the pearls are strung. Put your pearls on last before you leave the house. Wearing the jewelry while you're getting ready exposes them to damaging cosmetics, perfumes, and other chemicals. When you take the pearls off, wipe them down with a soft cloth. Real pearls are organic, which means their color is subject to change. To prevent yellowing, store pearls in a non-abrasive fabric pouch or a fabric-lined jewelry box. Keep the pearls hydrated by placing a damp cloth or wet cotton balls in with the pearls, and move the pearls away from any sources of heat. Don't store your pearls with other jewelry because pearls can be scratched easily when metal or gemstones rub against them. Find a special slot in your jewelry box for the pearls, or keep them in a soft bag made from chamois or another non-abrasive material. Store the pearls flat to avoid stretching out the strand of silk thread.